If your drums came from the factory with one of the above emblems, they ARE NOT compatible with Drum Slips. SFZ Snares are easily identified by looking at the manufacturer's emblem. All 9200 and 9300 SFZ snares are equipped with the SFZ emblems from the factory. 9200 - The early 9200 SFZ drums came equipped with a gold square emblem with black SFZ text, while the later models came equipped with a gold rounded square emblem wtih black SFZ text. The model number on the badge should start with MS92 - which identifies the drum as a 9200 Series marching snare. The following digits on the model number after MS92 will identify the diameter of the drum. If the model number reads MS9214, this confirms that your drum is a 14" drum, if the model number reads MS9213, this confirms that your drum is a 13" drum. 9300 - All 9300 SFZ drums come equipped with a gold oval emblem with flat edges on the sides. The SFZ text is written in black. The model number on the badge should start with MS93 - which identifies the drum as a 9300 Series marching snare. The following digits on the model number after MS93 will identify the diameter of the drum. If the model number reads MS9314, this confirms that your drum is a 14" drum, if the model number reads MS9313, this confirms that your drum is a 13" drum. SFZ MTS Snares are easily identified by looking at the manufacturer's emblem and are only available for 9200 drums. All 9200 SFZ MTS snares are equipped with the SFZ emblems from the factory. The early 9200 SFZ drums came equipped with a black elongated square emblem with gold SFZ text, while the later models came equipped with a black elongated rounded square emblem wtih gold SFZ text. The model number on the emblem should start with MS92 - which confirms that the snare is in fact a 9200 series drum. The following digits on the model number after MS92 will identify the diameter of the drum. If the model numbers reads MS9214, this confirms that your drum is a 14" drum, if the model number reads MS9213, this confirms that your drum is a 13" drum. Very early SFZ MTS snares came equipped with the standard SFZ gold square emblem with black text from the factory. These drums are extremely rare and we do not sell this variation directly though our website. However, we do provide Drum Slips for this variation upon request. Please call or email us for more information. If your snare drums came from the factory with one of the above emblems and are one of the sizes listed below, they ARE compatible with Drum Slips. During this mid-cycle refresh two new sets of tenors were also introduced to the 8200 Series line-up: The 8"-10"-12"-13"-14" Sumo Quint set and the 6"-8"-10"-12"-13"-14" Sumo Sextet set. These two configurations only have variations where the spot drums are attached to drums 1 and 2. Quad drum configurations were not affected by this refresh and have remained the same since the launch of 8200 Series Tenors. If your 8200 Series Tenors have a custom factory shell depth cut, please contact us before ordering. Due to the custom shell cut, our standard 8200 Series Drum Slips will not fit these drums. If your tenor drums came from the factory with the above emblem and are one of the configurations listed below, they ARE compatible with Drum Slips. Yamaha Field-Corps 8300 Series Tenors come in many variations and configurations. 8300 Series Tenors can be identified by the gold oval manufacturer's emblem that is flat on the edges. The model number on the badge will read MQ83, which identifies the drum as being an 8300 Series marching quad (tenor set). The following digits on the model number after MQ83 will identify the diameter of the drum, but does not tell you the tenor configuration in which that drum belongs. For Example, a 10" Field-Corps Tenor Drum will read MQ8310, but does not tell you if the drum belongs to a small, large, or sumo tenor configuration. 8300 Series Tenors can also be identified by looking at the lug casing hardware. 8300 Series Tenors have lug casings with a very small notch in the center that does not sit flush to the shell of the drum. Yamaha Field-Corps 8200 Series Bass Drums are available in ten different sizes. 14", 16", 18", 20", 22", 24", 26", 28", 30", and 32". The 14"-28" drums are 14" wide and the 30" and 32" drums are 16" wide. Field-Corps 8200 Series Bass Drums can easily be identified by the manufacturer's emblem. 8200 Series Bass Drums come with a gold emblem that is curved on the top and flat on the bottom. The model number on the badge will read MB82, which identifies the drum as being an 8200 Series marching bass drum. The following digits on the model number after MB82 will identify the diameter of the drum. For example, an 18" Field-Corps 8200 Series Bass Drum will have a model number that reads MB8218. 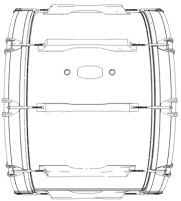 8200 Series Bass Drums can also be identified by looking at the lug casing hardware. 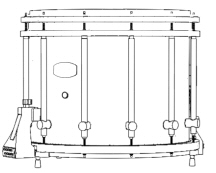 8200 Series Bass Drums have lug casings with an arch in the center that resembles a bridge, the center of the lug casing does not touch the drum. 8200 Series Bass Drums come in stained and wrapped variations. Click here for more infomration about the differences between stained and wrapped Field-Corps drums and why we have separate Drum Slips for each variation. If your 8200 Series Bass Drum has a custom factory finish, please contact us before ordering. Custom Series 8200 Bass Drums have different air hole locations than the standard 8200 Series Bass Drums and require custom cut Drum Slips. 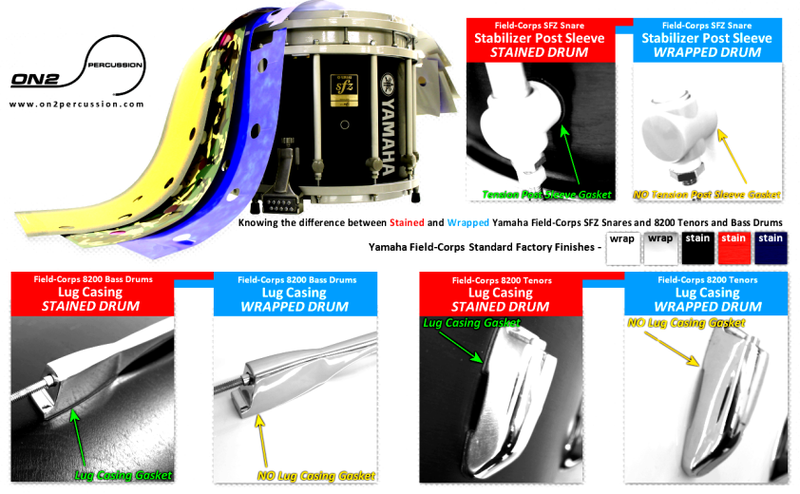 If you aren't sure if your drum has a standard or custom finish, view the section below about Stained and Wrapped Yamaha equipment. If your bass drums came from the factory with the above emblem and are one of the configurations listed below, they ARE compatible with Drum Slips. Yamaha Field-Corps 8300 Series Bass Drums are available in ten different sizes. 14", 16", 18", 20", 22", 24", 26", 28", 30", and 32". The 14"-28" drums are 14" wide and the 30" and 32" drums are 16" wide. 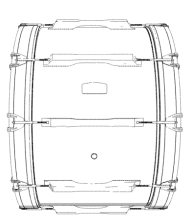 Field-Corps 8200 Series Bass Drums can easily be identified by the manufacturer's emblem. 8200 Series Bass Drums come with a gold emblem that is curved on the top and flat on the bottom. The model number on the badge will read MB82, which identifies the drum as being an 8200 Series marching bass drum. The following digits on the model number after MB82 will identify the diameter of the drum. For example, an 18" Field-Corps 8200 Series Bass Drum will have a model number that reads MB8218. 8200 Series Bass Drums can also be identified by looking at the lug casing hardware. 8200 Series Bass Drums have lug casings with an arch in the center that resembles a bridge, the center of the lug casing does not touch the drum. 8200 Series Bass Drums come in stained and wrapped variations. Scroll down for more information about the differences between stained and wrapped Field-Corps drums and why we have separate Drum Slips for each variation. Stained & Wrapped - What's the difference? The following information applies to both 9200/9300 and 8200/8300 Field-Corps equipment. All Yamaha Field-Corps drums come in either a stained or wrapped finish. It's important to know the difference between Stained and Wrapped Yamaha Field-Corps drums if you're planning to order Drum Slips for your drums. But first, why did we create two version of Yamaha Field-Corps Drum Slips? Wrapped Finish Yamaha Field-Corps drums have a slightly greater circumference than Stained Finish Yamaha Field-Corps drums. This is due to the laminate on Wrapped Finish drums being about 1/16th of an inch thick. This minor increase in thickness due to the wrap results in a slight increase in the circumference of the shell of the drum. Here at ON2 Percussion we could have designed a Drum Slip that would have fit both Wrapped and Stained Yamaha Field-Corps drums. 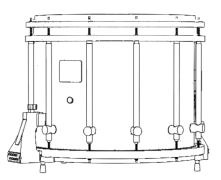 This design would have fit less precisely for both versions, as it would have been made to accommodate the difference in dimensions and hardware placement for both types of drums. So what did we do? 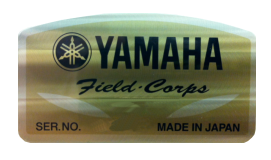 We designed Drum Slips for Yamaha Field-Corps drums not once, but twice. Precise measurements and data were taken from every variation of both Wrapped Finish Yamaha Field-Corps drums and Stained Finish Yamaha Field-Corps drums. This was done to provide our customers with the best quality product possible. If your drum has a non-custom standard factory finish, then it will be one of five colors. All non-custom standard factory drums that are white or silver have Wrapped Finishes. Black Forest, Blue Forest, and Red Forest all have Stained Finishes. There are several other ways to tell if your drum has a Wrapped or Stained Finish as well. The Most obvious would be to see if your drum has a wood grain texture to it. If it does, then your drum is Stained. If your drum has a smooth glossy white or silver finish, then it is Wrapped. Another way to tell if your drum is Wrapped or Stained is by looking at the Tension Post Sleeves on the Snare and the Lug Casings on the Tenors and Bass Drums. As you can see in the image, Stained Finish Yamaha Field-Corps Snare Drums have a black gasket between the Tension Post Sleeve and the outer shell of the drum, and the Tenors and Bass Drums have a black gasket between the Lug Casings and the outer shell of the drum. Wrapped Finish Drums do NOT have a gasket. This gasket is put in place on Stained Drums to compensate for the difference in circumference due to the absence of the Wrapped laminate material not being present on Stained Drums. If your drum has a custom finish from the factory, then you must look to see if your drum has these gaskets to tell if your drum truly has a Stained Finish or a Wrapped Finish, the colors mentioned earlier do not apply to custom finish drums.